New Delhi, Delhi, India: The Indian healthcare industry is increasingly becoming a sunshine sector, driving revenue generation and employment. It is growing at a remarkable pace due to its strengthening coverage, services and increasing expenditure by public and private players. India poses to be a potential market with a large population, booming economy, rapid urbanisation and increased awareness level. This has enabled the Healthcare sector to grow at an extensive rate. Technology is exceedingly making its mark as a game-changer in the field of healthcare services delivery in India. The convergence of healthcare with the online industry and wireless technologies is playing a significant role in improving accessibility. With more than 6000 doctors from 30 super specialities, one no longer needs to indulge in endless searches for the correct medical help. HMD is a virtual one-stop arena for easy, reasonable and organised wellness services. It serves as a bridging channel in the web-based commercial healthcare arena, as it brings doctors and patients under one umbrella. It has made the facility to book health support and medical services online – possible! 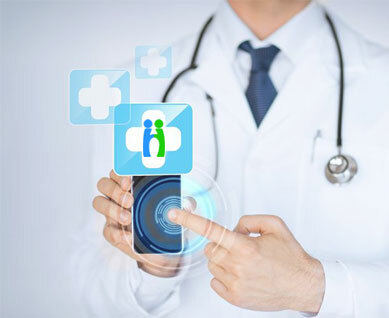 HMD houses the expertise of the medical industry, by creating an online system which provides services like booking doctors’ appointments and diagnostic tests, managing health records, secured data storage, online prescriptions, and access to medical records. So now, with that disturbing tooth ache, irritating skin allergy or recurring health issues, you know where to look out for instant help! Doctors can now breathe easy with a streamlined technique to archive and maintain appointments and patients’ health records. This will provide enhanced productivity in managing patients as medical professionals can preview patients’ profiles before an appointment. What more? HMD also automates accounting by its Patient Management software! For the comfort of patients, reserving medical appointments, diagnostic tests and buying medicines was never so easy! HMD provides a seamless method of managing health records and access them anytime for choosing a doctor globally. Additionally, patients can now compare and choose medical services as per their pocket allowance. HMD has synchronized healthcare services like never before! It provides a platform for the best medical services under one roof, and focusses on integrating healthcare services online across the globe. Wellness is now at your fingertips! Helpmedoc Health Services Private Limited (‘HSPL’) is a Private Company, incorporated on 04 September 2012. It is classified as an Indian Non-Government Company and is registered at the Registrar of Companies, Delhi. It brings medical expertise online for the convenience of doctors and patients.